Ex Hot Girl: BAN on Fast Food. South L.A. put into place a ban on fast food six months ago. 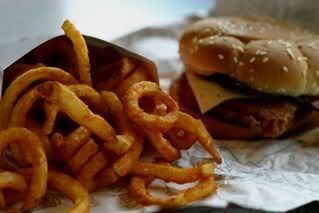 Now, it didn't force fast food restaurants to close, but prohibited the developing of new fast food restaurants, or more of them. You can read about it here in an article written by Mary Casper. The decision was made in order to ensure that the land left to develop led to a greater variety of non fast food restaurants and grocery stores, as opposed to more unhealthy fast food. According to the article, "When the moratorium took effect, 73 percent of South Los Angeles restaurants were fast food, compared to 42 percent in West Los Angeles." So, once again, we see government dictating eating, in a way. It's no longer the biggest chunk of change, or first buyer that gets to develop whatever their business is on the land... it's what the government says is okay. I have no problem driving past Wendy's or McDonalds or Burger King and not going to get a burger. I don't need my government to decide a percentage of available land for developing each type of business. I mean, what will it lead to? 5% for dry cleaners, 7% for fast food joints, 2% for smoothie shops, 10% for liquor stores, 10% for grocery stores, 15% for clothing retailers, etc, etc? It's a little crazy. What do you think? I do understand the need to reserve land for development other than fast food. If there is that much fast food in S. LA then is there really need or even demand for another franchise? I think a much better approach would be to reduce demand for fast food by improving education about nutrition and requiring those places to post nutritional information prominently, like NYC has tried to do.